An easy pace or a slow, leisurely walk: Trisha is taking a daily amble through the forest so she can admire the color of autumn leaves. 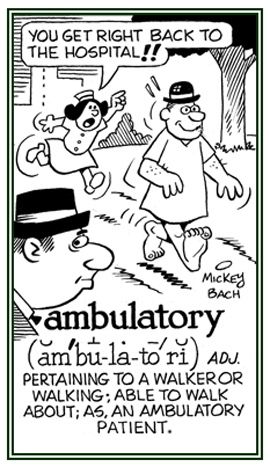 To walk slowly in a free and relaxed way or a leisurely manner; to stroll: Jim ambled around in the park during his lunch time. Teresa ambled from her house to to the bus stop because she left in plenty of time. 1. One of the five radial areas on the undersurface of the starfish and similar echinoderms, from which the tube feet are protruded and withdrawn: These ambulacra usually have rows of locomotive suckers or tentacles, which protrude from regular pores so they can move (walk) around. 2. The suckers on the feet of mites: Mites use ambulacra as a means of walking on and hanging on to their victims. 1. A specially equipped motor vehicle, airplane, ship, etc., for carrying sick or injured people, usually to a hospital: When Mike was injured in the car accident, he was rushed to the emergency medical center in an ambulance. 2. Formerly a field hospital; that is, on a field of battle where the wounded were carried out on stretchers, etc. by "walking bearers". 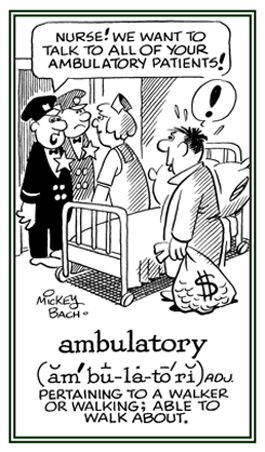 The term ambulance was borrowed from French hopital ambulant, mobile hospital, or literally, "walking hospital," from Latin ambulantem and ambulare, "to walk." Historically, soldiers wounded in battle usually stayed where they fell until it was dark or until the end of some particular combat when they could be carried or dragged off for treatment. This situation didn't change until 1240, when Italy's Misericordia di Firenze, the first known emergency-care service, was founded. Although primitive horse-drawn conveyances for the wounded made occasional appearances—at the Battle of Málaga in 1487, for example—it wasn't until 1792 that ambulances became a regular part of the battlefield scene. It was at this time that Baron Dominique-Jean Larrey, a French army surgeon, introduced what he called the ambulances volantes, or "flying field hospitals". Such conveyances were covered, portable litters filled with bandages to stop the flow of blood and to bind the wounds of soldiers on the battlefield. The transporter was also called the hopital ambulant; that is, "walking hospital" or "traveling hospital." 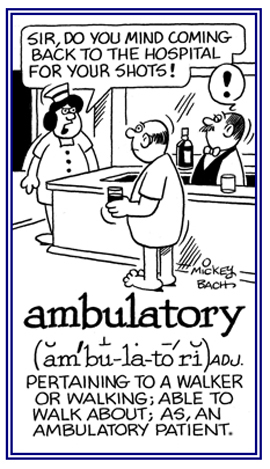 The English borrowed this idea and the name; however, they dropped the first word and anglicized the second so that today the vehicle used to transport the sick or wounded is now called an ambulance, even though neither it nor its patients are "ambulatory" and are certainly "not ambulating". One of the first modern ambulances appeared during the American Civil War, when Dr. Jonathan Letterman, medical director of the Army of the Potomac, assigned two horse-drawn ambulances to every regiment of 500 infantrymen. The Geneva Convention, in 1864, recognized military ambulances, declaring that the vehicles, the wounded they carried, and the medics that operated them, should be considered and treated as neutrals. Pleasantville, New York; 1980; page 19. Thereby Hangs a Tale by Charles Earle Funk; Harper & Row; New York; 1971; pages 12-13 . Hart Publishing Company, Inc.; New York; 1977; pages 19-20. A reference to walking or moving around from place to place: Shirley was an ambulant patient and so she didn't need a wheelchair to get to her destination. To walk around or to go from place to place by walking: Mark ambulates for exercise every evening before dinner.. I like long walks; especially, when they are taken by people who annoy me. A reference to roaming and moving from place to place: Ted and Mary were striving to improve their ambulating distances every day. To go from here to there by using the feet in motion: The elderly man's daily ambulations helped to keep him in better physical condition. A descriptive term for going forward by means of the feet. 1. Someone who goes from place to place; a walker: Jane was a regular ambulator for several times each day. 2. An instrument for measuring distances: The surveyor was using an ambulator consisting of a wheel to roll along over the ground with a dial plate to measure the distance traveled from one point to another one. Being equipped or fit to go to places on foot. 1. An aisle surrounding the end of the choir or altar of a church: The ambulatories of places of worship are reserved for the clergy and the organized group of singers. 2. The covered walk of a cloister with a wall on one side and a colonnade open to a quadrangle on the other.The visitors were walking around in the ambulatory of the historical monastery. 1. Pertaining to, or capable of walking: The plan for the exploration of the city was for those ambulatory tourists who liked to stroll from one part to another one. 2. Adapted for walking, as the limbs of many animals: Some sea creatures are ambulatory, moving from place to place seeking better feeding grounds. 3. Moving around or from place to place; not stationary: The physiotherapist was helping the patients become more ambulatory in their goal to become more independent. 4. Not confined to bed; able or strong enough to walk: Glenda was an ambulatory patient who could go home instead of having to stay in a hospital bed. An ambulatory health service is for people who are not required to be hospitalized because they are not physically handicapped and so they are able to proceed on foot in a normal way. 5. In law, not fixed; alterable or revocable: Mark left an ambulatory will for his daughter in case something were to happen to her and she couldn't be available to benefit from it. © ALL rights are reserved. The administration of anesthesia, which makes the patient insensitive to pain, when he or she is admitted and discharged on the same day of a minor surgical procedure: When Mariam fell and had a minor wound on her arm, she had ambulatory anesthesia during the medical treatment and so she was able to walk to her car with her husband so he could drive her home. Showing page 1 out of 7 pages of 93 main-word entries or main-word-entry groups.